This led to the inevitable question of what else Jews should be called which led to the obligatory reading of wikipedia's list of religious slurs. As a (non-practicante) Catholic, I'd just like to say that article - which I won't link to because it's kind of terrible - was more than half slurs about Catholics, most of which were sort of funny.. including bead jiggler/rattler/mumbler. Therefore, it's not like I said something offensive! I said Jew, which is what you're called when you're Jewish. Like I practice Catholicism, so I am a Catholic. I ain't mad at ya. That's what I am. For further reference, see Adam Sandler: "OJ Simpson, not a Jew." It's an okay word if it rhymes? Is that how this works? Did I miss the boat when this was no longer an everyday descriptive noun? Someone needs to keep me up to speed on what's PC, because I'm always last to know. Smashley, this is your department. See also: that time I told Barb and Jeff I was likely converting because I was on a Jewish boy streak (slump? Jkkkk) and I was going to have to convert someday, so I might as well get it out of the way. I'm a huge Judeo-phile. If I'm not having meat on Friday, I'm making sure my fish is Lox, ya heard? 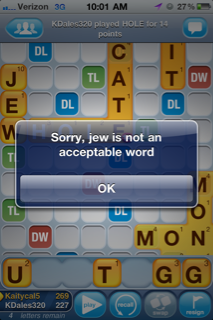 Really, I'm just pissed because the J was on a Triple Word score block, so I'm calling BS on Words with Friends. If I were playing scrabble with Grammie C, that would have been totally legit, whether or not it's a proper noun or Apple deemed it offensive. Spraguey, I think it's a proper noun. Apart from that, there has appARENTly been a long history of controversy on this topic. See http://scrabble.wonderhowto.com/blog/controversy-changed-scrabble-0114722/. Just sayin, my scrabble cheat website totally listed it, but apparently Words with Friends doesn't want to be a GAME OF HATE like it was in 90's? Ahhhhgressive. Make it be next weekend, K?